Editor’s note: Below we print excerpts of a statement from the Anti-War Committees in Solidarity with the Struggles for Self-Determination—a group that has worked tirelessly for Syrian freedom. An airtight case has been presented for the U.S. Left’s non-response to genocidal repression of the revolutionary struggle in Syria. It is what they see as the unbreakable principle that revolutionaries promote proletarian independence. Even as many on the Left oppose Bashar al-Assad, they distance themselves from the freedom struggle in Syria by the undeniable observation that U.S. imperialism is hostile towards revolutions, and only pays lip service to human rights to cover its own horrendous crimes and abuses. Trapped between proletarian principles and the nature of The Beast, the U.S. Left concludes that all they can do is confront their own imperialist bourgeoisie, while counseling the Syrian revolutionaries not to trust the U.S., Europe, or the UN. Principles and analyses are put to test in the course of political struggle. The tragic result of that conclusion was that much of the Left that supported the revolution in propaganda was, in terms of its practical demands, indistinguishable from the likes of Noam Chomsky, long a purveyor of the parochialist “fight our enemy at home.” That is not internationalism—and certainly not supportive of the Syrian revolution. The anti-Assad Left’s stubborn opposition to Syrian pleas for a humanitarian intervention also meant that, in regard to the main U.S. policy, they were indistinguishable from the apologists for Assad. This meant the two wings of the revolutionary Left coincided on key points: opposition to former President Barack Obama’s “red line” and condemnation of Donald Trump’s missile strikes. United front mobilizations around single demands can be effective, bringing together broad forces that are otherwise disunited, as per the historically classic example of the demands “U.S. Out Now” from Vietnam, and “U.S. Hands Off Nicaragua.” What hasn’t won the Left any victories is forming united fronts to reject humanitarian interventions demanded by the Syrian masses who were being bombed and starved. Although the U.S. Left’s opposition to humanitarian intervention has been the order of the day in Washington across two administrations, this has not meant a victory for our movement. On the contrary, the anti-war movement has withered and died. Under the leadership of Assad’s apologists we have witnessed neighborhoods, communities and cities buried under rubble, thousands of civilians killed and millions more driven from their homes. Many among the anti-Assad Left did call for lifting the embargo on arms to the opposition. Some even called for delivering ground-to-air missile defense systems. Others called for non-lethal aid, food and medicine to be delivered to the besieged. But to my knowledge, in the U.S., with the exception of our own small Anti-War Committees in Solidarity with the Struggles for Self-Determination, and our allies in News and Letters Committees, none on the Left called for taking up the demand widely raised by Syrians for a humanitarian intervention to stop the bombing, practically expressed as a call for a No Fly Zone (NFZ). Two things must be said regarding the opposition to interventions: first it meant that the anti-Assad Left could not work in unity with the Syrian diaspora, which mobilized repeatedly in mass actions for an NFZ. Second, the incongruity was painfully obvious: categorically opposing humanitarian interventions, while calling for imperialism to intervene through the supply of arms and other measures. Such contortions did nothing to challenge the really dangerous illusions held widely in the U.S. working class that an isolationist strategy can save us from being embroiled in wars. It is a remarkable feature of this period that distrust in the intentions of the Pentagon and politicians on Capitol Hill is fairly widespread. Illusions about the good will of U.S. imperialism are not the primary confusion among working people. Rather, the response to this recognition is confused, for instead of building international solidarity with peoples in struggle against austerity and for human rights and democracy around the world, the general sentiment seems to be that we must turn inward. Isolationism is a confusion that befuddles our struggles. The anti-Assad left, again with notable exceptions, by adopting a categorical rejection of the Syrian appeals for a humanitarian intervention, has in practice adapted to the isolationist sentiments to which the apologists pander in a deceitful manner. In regard to the struggle for leadership, which is the irreducible material down to which all political struggles are boiled, trapped by its own conclusions, the anti-Assad Left could not challenge the apologists who held tightly onto the leadership of the main U.S. anti-war coalitions. Once their leadership over anti-war opposition was accepted, the apology for genocide—and its normalization—inevitably resulted. Thus, although the International Socialist Organization (ISO) has to its credit promoted Syrian intellectuals, such as Joseph Daher, and publications of such important works as Yassin al-Haj Saleh’s The Impossible Revolution (which quite pointedly does not categorically reject the appeal for an international intervention), it did so even as it supported Ajamu Baraka’s candidacy, even as Baraka openly praised the Assad regime and engaged in atrocity denial. Thus, more recently, the united forces against fascism in this country include the ANSWER coalition, which is an open supporter of fascism in Syria. Having failed to split the anti-war opposition on principle from the apologists for genocide, the anti-Assad Left can only ever challenge its opponents in propaganda, which is meaningless to the Syrians being bombed. Deprived of our own anti-war banners, the practical imperatives of confronting the fascists and the Trump administration’s attacks on immigrants and Muslims has repeatedly subordinated solidarity with the Syrian struggle and principled opposition to atrocity denial. That has made it possible for the apologists for genocide of ANSWER and the Workers World Party to be accepted on the Left as “comrades.” The result is that the apology for genocide has become normalized within the ranks of the U.S. Left and the popular movements in which it intervenes. Many Syrians look upon this moral collapse of our movements with complete disgust, and thus not only is the Left unable to connect to the Syrian struggle, many Syrian activists have begun openly questioning the relevance of a Left which accepts “comrades” engaging in atrocity denial. These results were not the desired outcome the anti-Assad leftists sought, but these are, nonetheless, the results toward which this principled sector of the U.S. Left fatally stumbled. Another point needs to be made about the principled U.S. Left’s response to the Syrian revolution. Reading their material, one cannot help but draw the conclusion that they think the revolution was primarily lost by its leadership, not crushed through massive repression. Some forthright elements of the anti-Assad Left are explicit in this charge. But even the elements that avoid such sharp accusations have not really distanced themselves from the charge. If one accepts that collective punishment of civilians by the Assad regime, with massive direct support from Russia and Iran, rolled back the territorial gains of the revolution, then opposition to the bombing logically follows as the central demand for the solidarity movement. To build united actions with the diaspora, it would not have been necessary to support Syrian demands for an NFZ, but it was certainly necessary not to reject these demands (which is how I read Mr. Yassin al-Haj Saleh’s position and the appeal that we “listen to Syrians”). The key was to recognize the primary task of opposing the bombing. 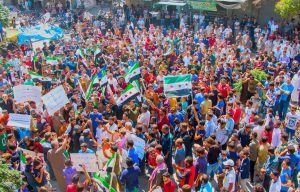 Instead of building a united solidarity movement against the bombing, united with allies in the Syrian diaspora who repeatedly took to the streets, the anti-Assad Left largely accepted the core argument made ad nauseam by the apologist Left, and now plainly absurd, that a humanitarian intervention to stop the bombing could only make matters worse—worse than genocide. Therefore some reason had to be offered for how such a heroic struggle as the Syrian revolution could suffer defeats, and why we could not build a united solidarity movement with the Syrian diaspora against the bombing. The leaderships of the U.S. anti-Assad Left, consciously or not, fell back on the rather canned conclusion that without proletarian leadership the revolution was doomed to failure. Somehow the relentless explosions of concrete rubble and shrapnel and the terrible toll these took on the Syrian leaderships was ignored, as if the problem were only one of clarity and resolve. A balance of the U.S. Left suggests that it is our clarity that is in question and our resolve that was lacking. What is remarkable about the fatalism of the U.S. anti-Assad Left is how it follows strictly from an argument that assumes the intentions of U.S. imperialism are decisive, and not the balance of forces in the struggle. We would be silly to believe the U.S. ruling class has the good intentions to raise the federal minimum wage to a level allowing working families to rise out of poverty. Yet, the obstinate opposition of the capitalist class notwithstanding, revolutionaries generally support the struggle of Fight for $15 Now (and I do not refuse to participate in the movement because its leadership is “reformist”). This is not an isolated example; on the contrary, it is generalizable: the intentions of the ruling class are relevant, but so are ours. There are great risks that U.S. imperialism could use the pretext of humanitarian intervention to corrupt the democratic revolutionary struggle, but it would be perverse for U.S. Leftists to now breathe a deep sigh of relief, since no such intervention has taken place, and resistance in Syria has been reduced to a last stand in Idlib. On the contrary, the danger of foreign control over the revolutionary struggle, which will continue until Assad is overthrown, has grown precisely to the degree to which the mass popular movement has been forced by relentless bombing and sieges to hole up and endure terrible sacrifices. Short of a humanitarian intervention, the fatal end was foreseeable in one revolutionary stronghold after another. This entry was posted in Articles and tagged Ajamu Baraka, ANSWER, Anti-War Committees in Solidarity with the Struggles for Self-Determination (AWCs), Arab spring, Barack Obama, Bashar al-Assad, Donald Trump, Gaza, genocide, Idlib, International Socialist Organization, Iran, Israel, Joseph Daher, News and Letters Committees, no-fly zone, Noam Chomsky, Russia, Syria, U.S. Left, Vladimir Putin, Workers World Party, Yassin al-Haj Saleh, Yemen. Bookmark the permalink.